Buildings are a major source of greenhouse gas emissions and cost-effectively reducing their energy use and associated emissions is particularly challenging for the existing building stock, mainly because of the existence of many architectural and technical hurdles. The transformation of existing buildings into low-emission and low-energy buildings is particularly challenging in cities, where many buildings continue to rely too much on heat supply by fossil fuels. However, at the same time, there are specific opportunities to develop and take advantage of district-level solutions at urban scale. 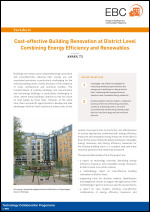 In this context, the project aims to clarify the cost-effectiveness of various approaches combining both energy efficiency measures and renewable energy measures at the district level. At this level, finding the balance between renewable energy measures and energy efficiency measures for the existing building stock is a complex task and many research questions still need to be answered. 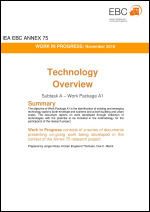 The objective of Work Package A1 is the identification of existing and emerging technology options (both envelope and systems and at both building and urban scale). The document reports on work developed through the collection of technologies with the potential to be included in the methodology for the participants of the research project.